I am SO glad it's almost the weekend! I am looking forward to getting a lot accomplished this weekend! A little cleaning, some organizing and maybe a little baking! We also have some new furniture being delivered today from Hom Furniture so I am busy rearranging and preparing for that to arrive, yippee! Super excited for that! On Sunday, we have plans to go to a friends house for the Super Bowl party. So, I am hoping to get in my craft room sometime tomorrow to put together a little gift to bring for hosting the party. What's your plans for the weekend? My Craft Spot stamp sets. The pattern papers are from MME-Love me collection. I used Kraft card stock for the base of the card. I cut 3 different panels from pattern paper and layering them on for the base layer. I stamped the bear using the PK159 Thinking of You Bear and then fussy cut around it. I colored in the eye, added some rosy cheeks and cute little freckles. The pink heart is cut from the Create A Critter 2 cartridge at 2 1/2 and then glittered around the edges with sparkling ice glitter. I stamped the adorable sentiment with My Craft Spot's Bundle of Joy stamp set. The super cute banner was created by using My Craft Spot's Tiny Banners & Toppers metal die. I tied it on with cherry cupcake trendy twine and tied bows on the end. I finished with a pink/white gingham double bow, a cherry cupcake twine bow and a fun button embellishment from Recollections. Today is my DT day over at My Craft Spot and I have a quick Valentine card to share with you using My Craft Spot's Build a Valentine stamp set. Another awesome set for your Valentine cards, layouts and/or treats. I started with cutting a pink panel and adhered it to the white card base. I embossed the red layer with the honeycomb folder for some texture. I added a little heart border using a Martha Stewart punch and then another border using My Craft Spot's Fancy Edges metal die. 1 1/4 with Kraft paper. I embossed the red heart with the script folder and the smaller heart ran it through the crimper for fun texture. I also cut smaller hearts at 3/4", crimped them and layered them on the banners. The little tag is from the Tickets metal die and stamped with the Build a Valentine stamp set. I tied on a Trendy Twine strawberry cupcake bow and added a small pearl to the center. The banners are cut using the Lacy Banners metal die. I embellished the banner by adding little hearts, pearls and a prima flower and then tied on with strawberry cupcake twine. I used the Jaded Blossoms Candy Wrap metal die and I wrapped some yummy Hershey nuggets with Valentine pattern paper for one of the packages and the other package I used the Valentine Wraps stamp set for the candy wrap. Then using the Wedding Candies stamp set I stamped the little images and sentiments. I used a 3/4 "SU punch and then adhered them on top. I placed them in the 2.25 x 8 clear bags I picked up there also. The tag is from Jaded Blossoms Treat Tag metal die. I stamped the sentiment along the bottom of the tag with the Candy Wraps stamp set. I embossed them with the spots & dots folder. I added a little lace and tied a small twine bow with pink sorbet from My Craft Spot. I tied the tag to the treat favor with some red tulle I had in my stash. Be sure to stop by again tomorrow! 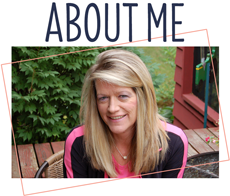 It's my DT day at My Craft Spot and I will have a project to share with you! Hi Everyone & Happy Monday! Today is the start of a new challenge at My Craft Spot and I wanted to share a couple cards I made using the Stamping All Around Spring and the New Arrival stamp sets. How fun is that? Who doesn't love polka dots....love this challenge! I found this cute Baby Romper shaped card at the Silhouette store and knew it was perfect for a couple baby cards I needed to make. I had just the right papers in mind for these cute cards....the pattern papers are from the Echo Park Dots & Stripes collection. I inked around the edges with TH weathered wood and peeled paint and then added some fun little brads that I had in my stash. I used My Craft Spot's Tiny Doilies metal die and then stamped the sentiment and the little feet with the Stamping All Around Spring stamp set for the cute pennant. I added foam tape for dimension between the layers and adhered it in place. The inside label is cut at 2 1/2 with the Elegant Edges cartridge and then stamped the sentiment with the New Arrival stamp set. The little stamped flourish is from the Tiny Tags 2 stamp set and the bling from Recollections. 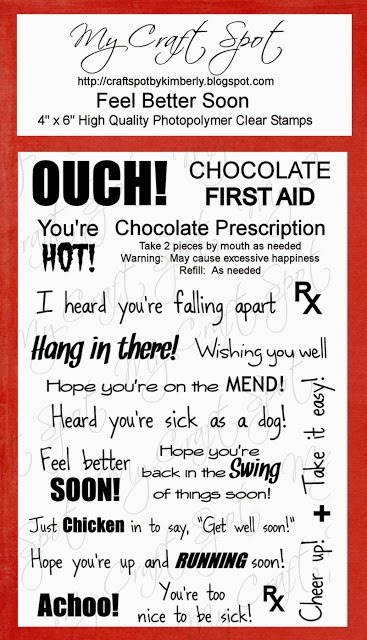 You could easily turn these into shower invite cards~Cute, ha? Be sure to stop and check out what the amazing Design Team has created for inspiration and then come back and join in ....We'd love to see what you create!! 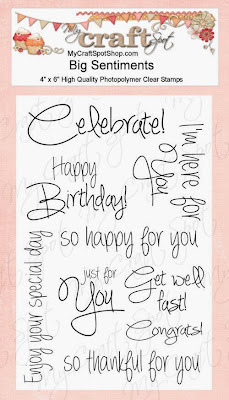 Today is my DT day over at My Craft Spot and would like to share a birthday card that I made using the Banner Sentiments stamp set. When creating my card, I also kept in mind a few challenges along with our fun sketch challenge going on this week at My Craft Spot. I cut a white and black panel, rounded the corners and adhered it to the card base. At the bottom of the panel I layered a cute border with the fun arrow using the Fancy Edges metal die. I cut the hearts from the Heart Border metal dies and layered the smaller hearts with foam tape for dimension. The papers are from an older SU paper stack~I am trying to use up my scraps and older papers this year, yay! I stamped a cute PK face on the center heart using the NEW PK1357 Sweet On You Face Asst stamp set from the January 2014 release. I can't wait to use this set more...so many possibilities. It is just adorable! I added glossy accents and a white gel pen for the eyes for a fun look. The tag is from the Ribbon Banners~Straight metal die and I stamped the sentiment with the Banners Sentiment stamp set. I inked around the edges with Memento tuxedo black ink and added a little gem that was in my stash. I tied a bow with natural Jute String and then a second bow with some gingham ribbon I got from Michael's. 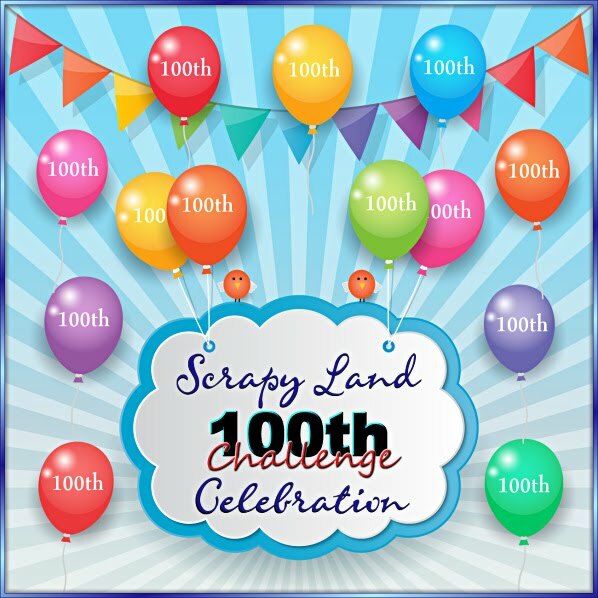 I wanted to join in a few challenges going on this week that I haven't had the chance to play in lately, yippee! The tags are cut at 3 3/4 and 4 1/4 from the TBBM2 cartridge. I used papers from MME Merry Days of Christmas collection. I found this cute little snowman at the Silhouette store and cut it with my Cameo. I cut it at 3 1/2 and layered him on the tag using foam tape for some dimension. I also inked around the edges and did a little doodling. The snowflakes are from My Craft Spot's Snowflake Border metal die. I added glitter and a gem to the center for a fun sparkly look. I tied on some Scarlet Red and with the Caribbean crinkle ribbon tied a double bow. I also added a Trendy Twine Peppermint Stick bow and a cute little button from October Afternoon. The sentiment along the bottom is stamped with Tiny Tags stamp set. I have a super cute tag to share with you that I made using Jaded Blossoms adorable Monster Mash stamp set. I have had this in my craft room for a while now and just finally got a chance to create with it :) Perfect to because they have an awesome challenge going on to! I started with Jaded Blossoms Treat Tag metal die. I stamped the cute little monster with the Monster Mash stamp set and colored it with copics. I added glossy accents to the eyes and fussy cut it out and then added foam dimensions and attached it to the tag. Isn't this just the cutest monster? I used the Layered Frame and Journal metal die set for the little balloons and stamped the balloons with sentiments from the Monster Mash stamp set and Wedding Wishes stamp set. 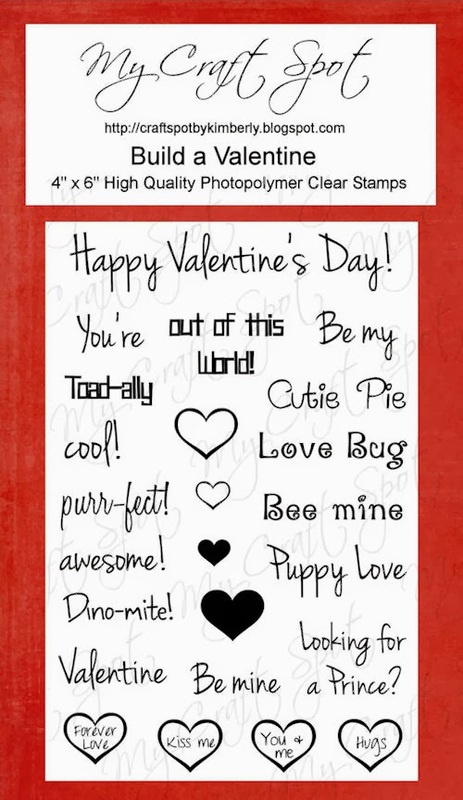 The "I only have EYE for you" is also stamped with the Monster Mash stamp set. I tied on some fun scarlet red crinkle ribbon from My Craft Spot, added a twine bow and a fun polka dot button that was in my stash. I filled the cello bags, also from Jaded Blossoms with yummy chocolate candy bars and attached the tags to them. Today is my DT day at My Craft Spot and I have a FUN Valentine treat to share with you. I used the Jar Full of Spring stamp set and the Heart Border metal die both from the last release. I also used another favorite stamp set of mine, the Always & Forever stamp set. as I was making them, lol! I started with pretzel logs and dipped them in confetti vanilla candy melts. I then rolled them in Valentine candy sprinkles and then sprinkle red sugar and let them set up. I put them in pretzel bags and added a cute little tag to each one. The tags are cut at 2 3/4 from the Art Philosophy cartridge. The pattern paper is from We R Memory Keepers-Love Struck collection. I used the Heart Border metal die for the hearts and stamped the little sentiments from the new Jar Full of Spring stamp set. 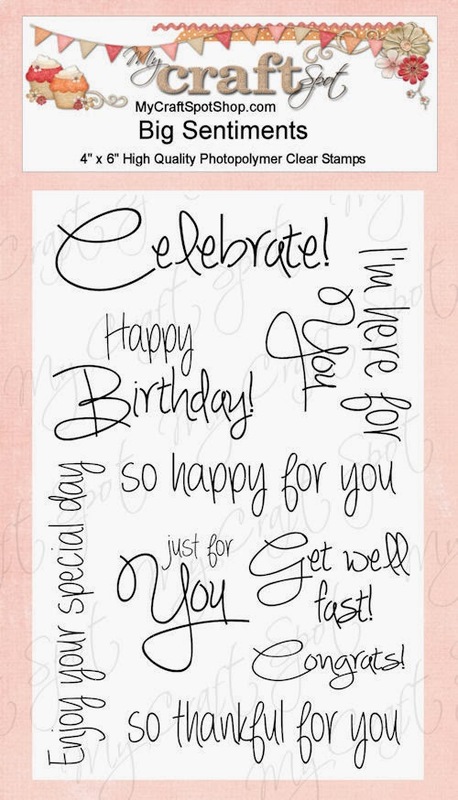 Oh my gosh, the little sentiments are so fun to use on this set! Did you see one even says text me :) too cute, ha? The little heart on the outer frame and is stamped from the Always & Forever stamp set. I also stamped to and from on the back of the tag from this set as well. I finished by tying the tags on with pink sorbet twine and tied a bow. I hope you had a great weekend! Wow, did the weather ever do a huge switch on us. We had such cold temps for the past couple weeks, even down to -40 with the windshield. On Saturday it was about 25 and yesterday in the 30's. Not complaining but what a huge change, it's crazy! We hope you enjoyed My Craft Spot's sneak peek Stamp Release and Blog Hop! So, what did you think of the release? Wasn't it just amazing? 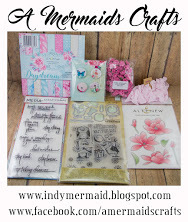 I seriously loved the stamps and dies on this release :) I had a blast creating with them! 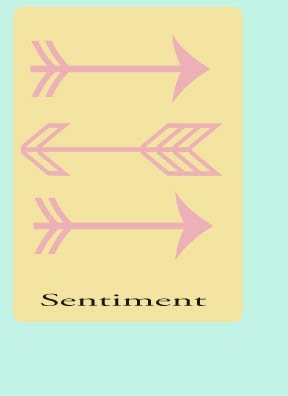 Well, one of my lucky followers will be winning the new Big Sentiments stamp set! Thanks again for all of you who visited and left comments last week for the sneak peeks and the blog hop! I appreciated all your kind words and so glad you like the projects and were inspired! I hope you are all having a great day and awesome weekend! Today I made a couple tags to attach to a cute little box I made to give as a little party favor or gift idea......you will see further in my post. It was perfect because I used up some more scraps in my bin :) I really am trying to use some up this year, it's over flowing, eek! The tags are cut at 3 3/4 and 4" from the Artiste cartridge. The little penguin and snowman is stamped with PKSC-19 July 2013 stamp set and then colored with copics and fussy cut around. I added foam dimensions and popped them on the tag. I tore some white layers at the bottom and added some SU dazzling details to the edge for a glittery, snowy look. The banners are My Craft Spot's Ribbon Banners-Straight Metal Die and stamped the sentiment with My Craft Spot's White Christmas stamp set. The snowflakes are from My Craft Spot's Snowflake Border die (which is one of my favorites) and added a fun skittle from my friend, Carri. I tied on some baby boy crinkle ribbon from 3 Girl JAM and a bow using Mandarin twine from My Craft Spot. I have attached them with foam dimensions to this cute box. I cut the boxes at 5 1/2 from the TBBM2 cartridge and filled the box with a yummy hot cocoa packet and some marshmallows! A fun little gift or treat favor for the little kiddo's when they are back from snow sledding! Thanks to all of you who visited and left comments this week during the sneak peek week~I really appreciated all the support! You are the best!!! It's finally the day you get to see the FULL release of My Craft Spot's new stamps and die sets! Woot-Woot!!! I am so excited for you to see the whole release because Kimberly and Robin really did and AMAZING job on this release!! This release has been so much fun to create with! We hope you enjoy the hop!! 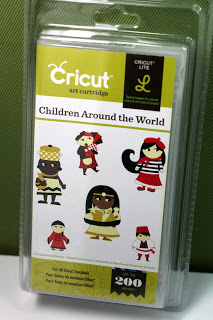 If you came from Ally's blog~Rock Paper Cricut than you are in the right place. If not, you will want to start at the beginning at My Craft Spot so you don't miss a thing. I found these adorable little 3D boxes with handles at the Silhouette Store and cut them with the Cameo. I sized them at 7.19 x 6.13 and cut them from pattern papers from a Martha Stewart collection I had in my stash. I created a cute border using the Fancy Edges metal die and adhered that in place and then assembled the boxes. The banner are the Ribbon Banners Wavy metal die and I inked around the edges and then stamped the sentiment with the Banner Sentiments stamp set. I finish by filling a cello bag with yummy candy and attaching a fun tag! I used the Tiny Doilies metal die and stamped the sentiment with the Stamping All Around Spring 2 stamp set and then tied the tag on with Scarlet Red crinkle ribbon. Thanks for stopping and have a wonderful wknd!